ARP wardens and other volunteers. French War Escape Hero lived in Grewelthorpe. Two boys killed by bomb. THE ROYAL BRITISH LEGION – GREWELTHORPE BRANCH. 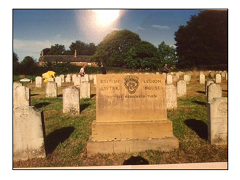 This is an attempt to produce some form of history for the Grewelthorpe branch of The Royal British Legion. Minute books are non-existant pre 1985. The Legion was founded in 1921 as a voice for the ex-servicemen’s community. It gained its Royal Charter on the 21st April 1925 with the title British Legion and by supplemental Charter dated 10th September 1971 it’s title was changed to The Royal British Legion. From an old account book it appears there was a group of some sort in 1931-1936 but there is a reference in post 1985 minutes that at that time it was an Ex-Servicemen’s Association. However pieces in the local newspaper, The Ripon Gazette of the 1930’s refer to the British Legion Grewelthorpe. County HQ are unable to give a formation date. There is however a report in the Ripon Gazette of 13.11.1930 which indicates the branch was formed between Nov 1929 and Nov 1930. Further search indicates it was formed on the 1st Monday in December 1929 [ See Gazette of 5/12/1929] Prior to this it is clear there was an ex-servicemen’s association probably formed in 1924. An Armistice Night message given on behalf of General James Dalton indicated that the branch was formed somewhere between Armistice Day 1929 and Armistice Day 1930 The branch started with 19 members. The Account book restarts on 1st October 1945 to 30 September 1957. The following are shown as President, Chairman, Secretary & Treasurer. Major General James Cecil Dalton. 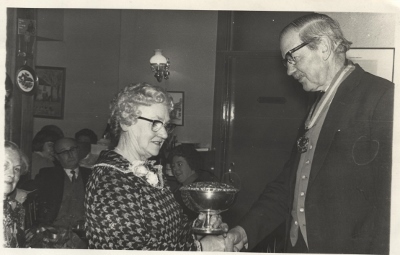 [Ex RA] 1930/1 and previously President of Grewelthorpe’s ex-servicemen’s Assoc. – source Ripon Gazette 14/05/1931. Died 1931. His obituary records state that he was a staunch RBL supporter & president of the Grewelthorpe branch. Major General Sir Charles Dalton. [Ex RA] 1931/39 and 1945 – and pre 1979-87. In 1972 the Ripon Gazette reported that Sir Charles was the new High Sheriff. He died Jan 1989 and at death is noted as having been a member since October 1935 +/-. 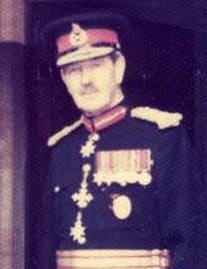 Major General Peter Bradley. [Ex Royal Signals] – 1987-1989. He joined the branch 13th June 1985. After some local moves he left in September 1998 to live near his family in the South of England. He died in June 2010. Mike Stancliffe. [ Ex Army] 1989-2002. Major J.Roger Chapman. [Ex Green Howards] 2002 – present. Son in law of Sir Charles Dalton. E. Horner. 1950 – 1951. R.E. Ascough. [Ex Sgt. RASC] . 1974-1987 then 1987 -2000. Died 2.8.2004. Believed to have been Chairman in excess of 30 years. L.Rowland – Jones. [Ex Army].2000 – 2001. D.M. Hartley. [Ex Army]. 2001 – 2017. F. Taylor. 1929 [+ Previously Ex-Servicemen’s Assoc.],1939. G.W.V.Richardson. [Ex First Royal Scots] 1955? – 1967? Frank Leathley. pre and post 1979. T.T.Procter. Pre 1985 – 1991 [Stated to have done 10 years]. I.H.Bradley. [Ex RAF] 1991 – 2009. John Wright Goundry. Secretary from 1929 until his death in 1938. W. Westwood. Pre 1930 [Poss Ex Servicemen’s Assoc.] died 2.12.1936. W.A. Stelling. [Ex KOYLI] 1936/39 + 1945. W. Morley. 1950 – 1951. Eric Ashby. [Ex RAF] Pre 1979 – 1998. Possibly started in 1951 as noted as having done 40 years in 1990. Rod MacAulay. [Ex RN]. 1998 – 2012. 10. Nov 1928. Crown Inn, Grewelthorpe. Ripon Gazette records that 30 ex-servicemen were entertained by Major General Dalton to supper. In his absence the General was represented by his son-in-law Lt. Col. Howard-Vyse. Nov 1929. Crown Inn Grewelthorpe. 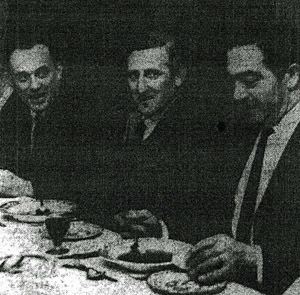 Ripon Gazette records that 30 ex-servicemen were, as has become customary , entertained to supper by Major Gen. Dalton. In the absence of the General his eldest son, Charles, presided. John Dalton was also present. Nov. 1930. Crown Inn Grewelthorpe. Ripon Gazette records that 40 ex-servicemen were again enertained to supper by Gen. Dalton on Armistice night. In the unavoidable absence of Gen. Dalton his son-in-law Col. Howard-Vyse presided. Nov. 1931. Ripon Gazette records an annual dinner held on Armistice Night at Crown Inn, Grewelthorpe. 32 members and friends attended. The room was tastefully decorated. Mr & Mrs Cook were congratulated on catering of the highest order to be associated with The Crown Inn. The President Charles Dalton was absent because he had left that day for service in Egypt with his regiment. Mr Reid presided, toasts by John Goundry. Nov 1932, 1934 . Jan 1987/88/89/90 & 1994. – Hackfall Inn Grewelthorpe. On 24 Nov 1932. the Ripon Gazette records that 30 attended the Annual Dinner on Armistice Night. Charles Dalton. the President, was away on service in Egypt, so his brother Major John Dalton. presided. Ripon Gazette 15.11.1934 records that 25 members and guests were present at the Annual Dinner at Hackfall Inn. There were various toasts and Mr & Mrs Hartley were congratulated on their excellent catering. Capt. 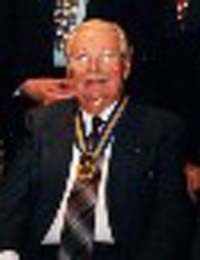 Dalton was President and J.F.Reid Chairman. 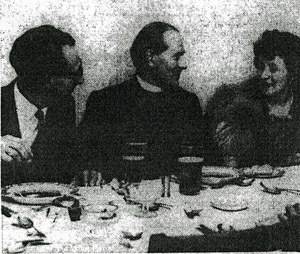 After dinner the company was entertained to music and jest by Mr. J.Walton, Mr & Mrs Wright and Mr Wass of Ripon. 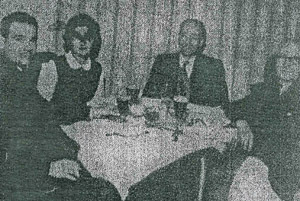 Ripon Gazette 18.2.1965 3 photographs appear in the newspaper of members & Guests at the Annual Dinner of the Grewelthorpe branch at the Hackfall Inn, Grewelthorpe. Left to right. Unknown ?. Freda Thompson. Jack Thompson ?. Unknown? Left to right. Mary Jones. Donald Leathley. Sir Charles Dalton. Lady Dalton. Gareth Jones. Left to right. A.R.Ashby. Marion Ashby? Unknown? Unknown? Ripon Gazette 3.2.1967. 2 photographs and article re. Annual Dinner at the Kings Head, Masham. The loyal toast proposed by Chairman Mr D.Leathley. who also proposed a toast to the Legion. Replying Major Gen. C.J.G.Dalton. gave details of what the Legion was doing and thanked Mr W.Richardson. for all the work he had done as Secretary since the Branch was reformed 21 years ago. Rev. G.T.Jones. proposed a toast to the visitors from Kirkby Malzeard & Masham and Mr Richardson. proposed a toast to absent friends. Two members who served in the war of 1914/18 were present. 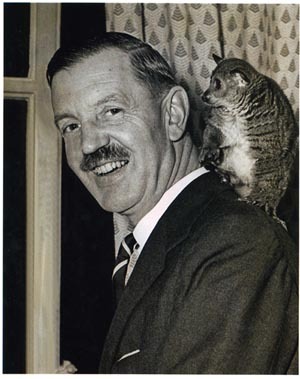 A film about the London Zoo was shown by Maj.Gen Dalton. Left to right. 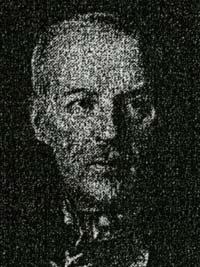 P.Drury [Kirkby Malzeard] L.Smith. A.R.Ashby. Left to right. D.J.Leathley [Chairman]. Rev. G.T.Jones. Mary Jones. Ripon Gazette 20th March 1970 Legion dinner Grewelthorpe. Kirkby Malzeard and Masham branches were welcomed at the annual dinner of Grewelthorpe Royal British Legion at The Hackfall Inn on Wednesday last week. D.Leathley proposed the loyal toast. E.Ashby proposed the toast to the Legion to which Charles Dalton replied. A toast to the visitors was proposed by R.Bain and Mr.D.Ascough replied and thanked Grewelthorpe for the invitation. A competition raised £22.17s.6d. Hostess, Mrs.D.Lewis was thanked by Mr. Leathley. A general meeting was fixed at The Hutts, Grewelthorpe provisionally for the 1st April. Ripon Gazette 5th Feb 1971. Legion dinner at Grewelthorpe. 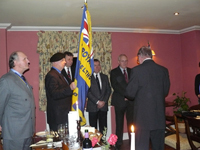 46 members of Grewelthorpe British Legion attended the annual dinner at The Hackfall Inn on Wed. last week. Mr D. Leathley who proposed the loyal toast welcomed the President Sir Charles Dalton and Lady Dalton and members of Masham & Kirkby Malzeard branches. a toast to the British Legion and guests was proposed by Mr E. Ashby and Mr E Green proposed a toast to absent friends. thanks on behalf of the guests were expressed by Mr. W. Taylor. A competition raised £18.3s for branch funds. Mr D. Sowery winner of the weight guessing competition returned the prize to be sold for funds. 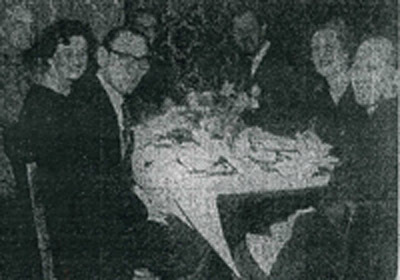 January 1979 Almost 80 people attended the Annual Dinner at Hackfall Inn. The evening was a special occasion as presentations were made to the Branch President General Sir Charles Dalton and to Mrs Freda Thompson who for the past 30 years has sold poppies in and around Grewelthorpe and who for 10 years has been Poppy Sale organiser. Another poppy seller Mrs Jean Ashby had completed 10 years service and she was presented with a certificate. Mrs Thompson was presented with an inscribed rose bowl in appreciation of her active service to the Grewelthorpe branch. Sir Charles received the RBL President’s badge for his services to the branch over many years. Mr Ted Calvert presented the award. He had served in the 1914-18 war. Freda Thompson accepting Rose Bowl from Gen. Dalton. Feb 1985. – Galphay Inn. Jan 1986. Jan 1995 & 1996. March 1997/98/99/2000. – Masham Golf Club. Ripon Gazette Feb. 1989. Report of Annual dinner at Hackfall Inn, Grewelthorpe. 65 members & guests attended. President Maj. Gen. Peter Bradley called for 1 min. silence for past President Sir Charles Dalton. & Lady Dalton was guest at dinner. Mar 1991. Aug. 1992. Jan. 1993. – Grantley Hall. In 1991 Raised £110 for St. Michael’s Hospice. Feb 1992 & Mar 2004 – Crown Inn Grewelthorpe. Left to Right. Standing. Graham Roberts. Peter Bradley. Bill Dobson. Ian Bradley [with tie] David Hartley behind. Mike Stancliffe. Fred Smith. Rod MacAulay. Lenny Rowland Jones. Roger Chapman. Tony Hill. Seated. Eric Ashby. Bob Ascough. Rowley Ashby. Mar 2001 & 2002. – Swinton Castle. March 2005. March 2006. March 2008. March 2009. March 2010. March 2011. March 2012. March 2013 – White Bear, Masham. Left to right. Tim Stebbings. Eric Clark. Roger Chapman. Walter Myers. David Hartley [behind] Ian Bradley. Peter Fettes [behind] Rod MacAulay. Tony Hill. Roger Chapman & Walter Myers in 2005. 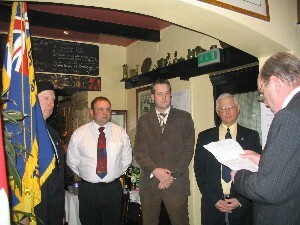 Induction ceremony took place at the Annual dinner at the White Bear, Masham. From L to R. Standard bearer Graham Roberts. Phillip Dowland. Anthony Prince. Barry Marr. David Hartley[Chairman]. March 2007. – The Annual dinner was held at The Queens Head, Finghall. March 2009. – Induction Ceremony at White Bear , Masham. Dominic Riley, Paul Holloway, & Lindsay Wilson. are inducted into the Royal British Legion at the 2009 Annual Dinner. March 2010. – Annual dinner held at White Bear, Masham. President Roger Chapman & Chairman David Hartley present a certificate of appreciation to Ian Bradley on his retirement from the post of Secretary. A position he had held for 19 years. 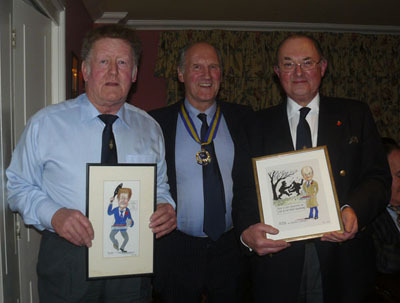 Roger Chapman also presented Tony Hill and Peter Fettes with hand painted caricatures to thank them for their superb efforts in selling poppies for the 2009 Remembrance Day. Rod MacAulay has indicated that he will retire from the post of Treasurer at the end of this year [2010/11]. Roger Chapman presented him with a caricature in thanks for all the work he has done. 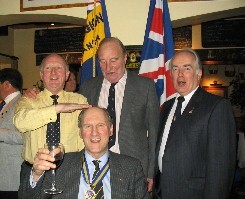 In March 2012 the branch again held its Annual Dinner at The White Bear, Masham. 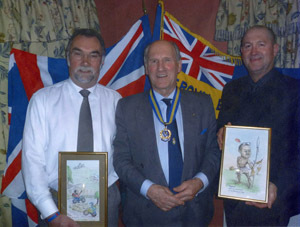 Pictured is Branch President Roger Chapman who presented caricatures to John Oldridge [left] who last Summer visited Leonard Lonsdale’s WW11 grave at Assissi in Italy and Tony Manning [right] who at last November’s AGM gave a short talk on his time with the South Rhodesian military during the Rhodesian war. In 2013 & 2014 the Annual Dinner was again held at the White Bear, Masham. In May 2015 the venue was changed and the Annual Dinner was held at Masham Golf Club there were 39 people present and everyone enjoyed good food and good company. Peter Fettes was presented with a certificate of appreciation for his efforts as Poppy Appeal organiser for the past 11 years. In the Spring of 2016 the Annual Dinner was again held at the Masham Golf Club. 41 members were present and had a highly enjoyable evening. In May 2017. 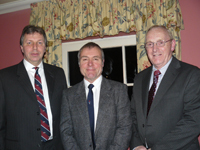 The Annual dinner was again held at Masham Golf Club. 39 members attended an excellent evening. In March 2018 the Annual Dinner was at The White Bear, Masham. A successful evening with 32 members present. Source Ripon Gazette 15.11.1928. 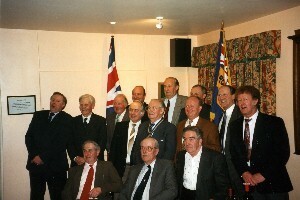 Members of the ex-servicemen’s Assoc. paraded last Sunday for the Armistice Day service. General Dalton took the inspection, there was a large congregation in church. Source Ripon Gazette 14.11.1929. A good muster of ex-servicemen paraded last Sunday morning at the church for the Armistice Day service. In the absence of the General due to recovering from illness, the parade was inspected by his son John Dalton. Source Ripon Gazette 13.11.1930. Remembrance service held in church in the morning and in the chapel in the afternoon. The British Legion attended in full force. The roll of honour was read by the Chairman. There was a full congregation. In the absence of General Dalton the parade was inspected by Col. Gething of Cayton Hall. John Goundry ,Hon Sec. of B.Legion, placed a spray of Flanders Poppies on the memorial tablet to 2nd. Lt. Leathley and on the grave of the late Mr. T.Thompson, a Brit. Leg. member. Source Ripon Gazette 12.11.1931. British Legion paraded & inspected by Col. Gething & Charles Dalton ,President & Mr J. Goundry Hon. Sec. Flanders Poppies were laid on the grave of Gen. Dalton [late president] and on memorial to Wm. Leathley in church. In the afternoon they attended a service in the Wesleyan Chapel. Source Ripon Gazette 10th Nov 1932. Parade & Service held on 6th November. John Goundry. the Hon. Secretary took the parade. Source Ripon Gazette 15th Nov 1934. Armistice Day parade last Sunday. Some 20 ex-servicemen paraded under Hon. Sec. J.Goundry and were inspected by Col. Gregson guest of Mrs. Dalton at The Hutts, Grewelthorpe. 2 mins silence at 11o’clock. Source Ripon Gazette 11 Nov 1937. Armistice Service was held last Sunday morning. Local ex servicemen attended. Source Ripon Gazette 10 Nov.1938. A Remembrance Sunday service was held at St. James’s Church in the morning. Members of the British Legion paraded under Mr. F.Taylor Hon. Sec. Source Ripon Gazette 16 Nov 1939. A Remembrance service was held at St. James’s Church last Sunday morning and was attended by members of the British Legion. The vicar Rev. J.H.Boon took the service and preached the sermon. The National Anthem was sung at the conclusion. Source Ripon Gazette 15 Nov 1956. 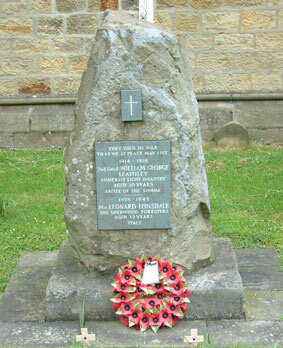 At St. James Church Grewelthorpe a special service was held and 2 minute silence observed. There was a good congregation which included members of the Grewelthorpe Branch of British Legion. Source Ripon Gazette 13 Nov. 1970. Because of repairs at the church the remembrance Day service was conducted by Rev. G.T Jones in the school. 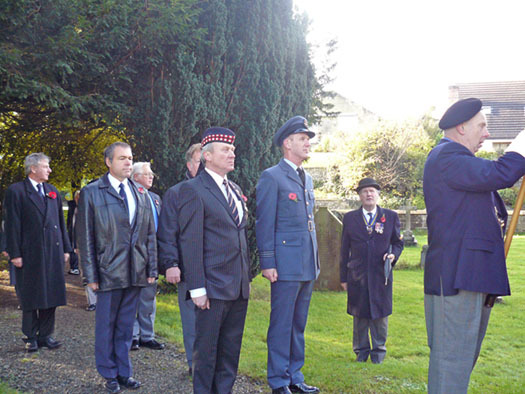 The service was attended by members of the British Legion. The lesson was read by Gen. Sir Charles Dalton. The pianist was Miss Jowett. Source Ripon Gazette. Nov 1971. 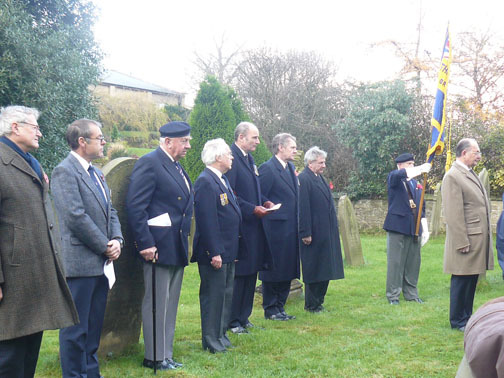 Grewelthorpe remembrance day service was conducted by Rev. G.T.Jones on Sunday morning. The lesson was read by Sir Charles Dalton and members of Grewelthorpe branch of the Royal British Legion and veterans of both wars attended. D. Leathley laid a wreath at the altar. Source Ripon Gazette. 17 Nov 1972. Remembrance day service. Mr D. Leathley chairman of the Grewelthorpe branch of the Royal British Legion laid a wreath of poppies on the altar of St. James Church Grewelthorpe at a Remembrance Day service on Sunday morning, conducted by the vicar Rev. G.T.Jones. branch of the Royal British Legion attended the Sunday morning service at St. James Church Grewelthorpe. The service was conducted by the Rev. G.T.Jones and Major Gen. Sir Charles Dalton read the lesson. Ian & Barbara Bradley. attended a Multi National / Multi denominational service whilst on holiday abroad. 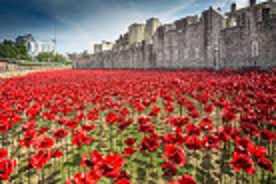 They were surprised to find that not many people appreciated the significance of the poppies. 12 Grewelthorpe Royal British Legion members parade into church on Armistice Day November 9th 2008. Left to Right. Eric Clark: Paul Holloway: Barry Marr: Tony Hill [hidden]: Michael Davies: Tom Johnson [RAF serving officer]: Roger Chapman. 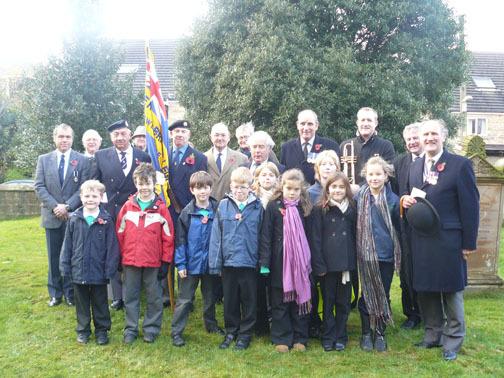 14 Members of the Grewelthorpe branch of the Royal British Legion together with a number of schoolchildren attended the Remembrance Day service at St. James’s Church on 8th November 2009. 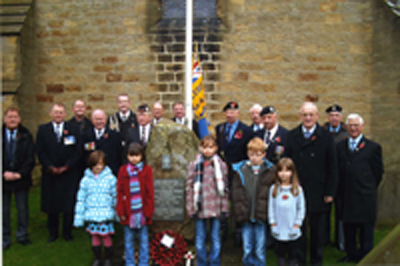 In November 2015 a number of members and public attended the Annual Remembrance Day Service at Grewelthorpe. 2 ceramic poppies, one bought by branch secretary Edward Threapleton and the other one bought by Paul Theakstone of Black Sheep Brewery, were presented to the church in a wooden oak case for permanent display alongside the roll of honour. These were 2 of the thousands that were placed in the moat of the Tower of London in commemoration of the centenary of World War 1. On 11th November 2018, Exactly 100 years after the end of WW1 the remembrance / Armistice Day service was held at St James Church. There was a large congregation. There was a photographic display in church. Prior to the occasion Ron Herrington had talked to the school pupils about his experiences in the RN in WW2. Ripon Gazette 28 June 1928. The Grewelthorpe ex-servicemen’s Assoc. held their 4th Annual outing to the Lake District. Goig thro. Wensleydale after an early start with 32 members & friends leaving at 6a.m. Breakfast was taken at The White Horse Hotel Hawes. After tea at White Hart, Penrith visit made to Lowther Castle ,seat of Lord Lonsdale. This was arranged by Maj. Gen. Dalton and was much appreciated. Ripon Gazette 27 June 1929. Last Saturday the ex-serviceen’s Assoc. held its annual outing to Whitley Bay & N.E.Coast exhibition at Newcastle. 35 members & friends went. The Hon. Sec. Mr F.Taylor made the arrangements. Ripon Gazette 26 June 1930. Annual outing to Blackpool. early start with breakfast at the Devonshire Hotel. Arrived Blackpool 10a.m. Returned via Ilkley. Organised by J.Goundry Hon. Sec. Ripon Gazette 25.6.1931. Annual outing, 34 set off to Scarborough at 6a.m. Ripon Gazette 10.3.1932. Annual outing to Lake District on 18th June agreed. Ripon Gazette 23.6.1932. Annual outing. 52 went to Lake District via Wensleydale. Paper describes a full itinerary & records congratulations to John Goundry. Hon. Sec. for superb arrangements. Source Ripon Gazette 22 June 1933. Last Sat. Brit. Legions annual outing was to Southport. Over 50 members & friends went. Hon Sec. John Goundry complimented on arrangements. Source Ripon Gazette 28 March 1934. Brit. Leg. outing last Sat. to Scarborough. 34 went. Breakfast at Helmsley. Return via York. to see civic week decorations & illuminations. J. Goundry arranged. Source Ripon Gazette 26.7.1934. On Saturday members of Brit. Leg. were invited to a garden party given by Mrs. Dalton & Capt. J.C.Dalton [President] at The Hutts. 18 were present. Others were unavoidably absent due to hay making ad J.Reid on holiday. After tea there was a walk around the grounds followed by a cricket match. L.Trenholme proposed the vote of thanks. Amazing activity was shown at cricket by some of the wounded members. Source R.Gazette 27.6.1935. In ideal weather last Sat. members of the Brit. Leg. had their annual outing to the coast. A party of nearly 30 left Grewethorpe at 6a.m. calling at The Golden Lion Hotel Stokesley for breakfast. A glorious run over the moor followed to Whitby rriving 10a.m. for sightseeing. Lunch was at The Talbot. Journey continued to Scarborough. Returning via Malton & York to arrive home just before midnight. Source Ripon Gazette 25.6.1936. Brit. Legion members, family & friends numbering 30 had their annual outing to Morecambe last Sat. They left soon after 6a.m. with breakfast at Hawes, arriving at Morecambe at 10a.m. for a glorious day except for a light shower on arrival. Dinner & Tea in Morecambe and the return journey was via Skipton & Blubberhouses arriving home about midnight. Source Ripon Gazette 24.6.1937. Brit. Legion 26 members and friends had their annual outing when they went by road to Blackpool. The party left 6a.m. and travelled via Blubberhouses & Skipton, where breakfast was served. Blackpool reached at 10-30a.m. and with weather favourable, an enjoyable day was spent. Grewelthorpe reached shortly before midnight. 29 June 1939. Source Ripon Gazette. Brit Legion had their annual outing to the East Coast. An early start was made and breakfast at York. The morning was spent in Bridlington where lunch was served, and then to Scarboro where tea was served. The homeward route was via Helmsley. Mr. F. Taylor [Hon Sec] was responsible for the excellent arrangements. Ripon Gazette 2nd May 1946. Social. 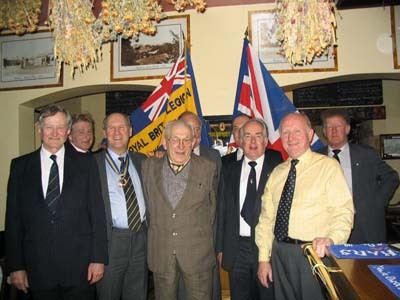 The British Legion [Grewelthorpe branch] held a Social in the school on Friday of last week. There was a good attendance. The Merrymakers Band from Dallowgill supplied the music and Mr. J. Askham & Mr J. Wood shared the duties of MC. See refernece to Merrymakers Band under War Time in the History section. 27th June 1946. Source Ripon Gazette. The Grewelthorpe branch of the British Legion had their 1st Annual outing since the war, last Saturday. A party of members & friends comprising of 3 bus loads left the village at 7-30a.m. for Bridlington & Scarborough. Bridlington was reached at 11a.m. after lunch the party proceeded to Scarborough where about 2 hours was spent, and after tea buses were boarded again. The return journey was made by Thornton Dale, Malton & York. Mr W. Morley was in charge of all the arrangements. Ripon Gazette 11th July 1946. British Legion. The Grewelthorpe branch held their monthly meeting & whist drive on Wed. last week. Mr.E.Horner was MC at the whist drive. During the evening, Mr. I.W.Morley was thanked for his part in organsing an outing to Scarborough & Bridlington. Ripon Gazette 19th Sept.1946. Social. The British Legion held a social on Friday. Mr. J. Askham was MC and the Merrymakers Band from Dallowgill played the music. There was a large attendance in school. Ripon Gazette 31st Oct.1946. Social. The local British Legion held a social on Friday in the school. A programme of games & dancing to Merrymakers Band of Dallowgill. Mr. E. Ascough, J.Denton & Mr. Young were MC’s. Ripon Gazette. 5th December 1946. Social. The local British Legion branch held a successful social in school on Friday. There was a large gathering The Merrymakers Band of Dallowgill supplied the music. Mr Young & Mr E. Horner were MC’s. Ripon Gazette 2nd January 1947. Social. The local of the British Legion held a social in the school on Friday. A large company attended. The programme consisted of games and dancing and music was played by the Merrymakers Band from Dallowgill. MC’s were Mr Young & Mr. E. Horner. Ripon Gazette 6th February 1947. The British Legion held their monthly social in the school on Friday. The Merrymakers Band supplied the music. Ripon Gazette 27th March 1947. The British Legion held a social in the school on Saturday. When the Merrymakers Band was in attendance. Mr Young was MC. Ripon Gazette 13 Feb 1967. In a small report about Masham branch annual dinner it was mentioned that some members from Grewelthorpe branch, and Kirkby Malzeard branch were in attendance. Source Ripon Gazette 14.10.1983. Photograph showing Annual seaside trip in 1930’s [ possibly 1933] to Southport. asking for information. Photo is too dark to reproduce here. 18th June 1988. R.B.L. Lister House, Ripon. Official opening. Some members went. 12 June 1990. RAF Leeming – Enjoyable visit. November 1993. London Albert Hall National Service of Remembrance. Martin & Val Dobson were to attend but in the end did not. 27th April 1995. Harrogate Victory branch social evening. Low turnout but good visit. 28th April 1996. Eden Camp, Malton. Successful trip 39 went. 12 July 1996. RAF Menwith Hill. [United States Communications Centre] A success with 27 attending. 6th October 1996. Georgian Theatre Richmond. Successful combined with museum visit. 15th June 1997. Royal Armouries Leeds. Successful outing 33 went. June 1999. Harrogate Victory branch social evening. Low turnout but good. 19th September 1999. Green Howards Museum Richmond. Low turnout but good. 2001. *80th Anniversary Service in York of the formation of Legion. *Walter Myers. attended with Harrogate Victory. 25th April 2002. Harrogate Victory branch social evening.13 went to a good night. 27th March 2003. Harrogate Victory branch social evening. 3 members attended. 23th October 2003. Harrogate Victory branch poppy concert. Ian & Barbara Bradley & Walter Myers. attended. 24 October 2004. RAF Leeming – Went well. 12 November 2004. National Service of Remembrance. London Albert Hall. Rod MacAulay. & his cousin attended. 15th April 2005.Lister House, Ripon. Social & Presentation of £500. 4th September 2005. Green Howards Museum Richmond. Only 3 went. 19th September 2006. Elvington Air Museum. 11 went and had a very good day. 25th October 2006. Harrogate Victory Branch social evening. 12 went. Good evening. 2nd October 2007. RAF Leeming – Good day, 15 went. 2007. Some were to attend launch of replica spitfire built by Ripon RBL. but due to change of date no-one could attend. 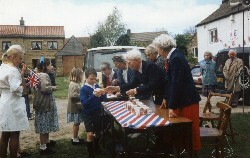 In earlier years the Branch had attended Garden parties, manning stalls and donating prizes. June 2008. Legion members went to Richmond to watch the Green Howards parade through the town after their return from active service. In 20 September 2008 Visit to Hartlepool Maritime Museum & Marina. 4 Attended. Good day. 8th November 2008. Members Rod MacAulay & Edward Threapleton. & their wives attended the Festival of Remembrance in The Royal Albert Hall, London. 2008 marked the 90th Anniversary of the end of WW1. 5th November 2009. A successful quiz & raffle fund raising evening was held at the Crown Inn to raise funds for the poppy appeal, this raised £252.00 which is included in the 2009 poppy appeal figure shown below. 7th November 2009. Chairman David Hartley & his wife attended the Festival of Remembrance at the Royal Albert Hall, London. 24th June 2010. A small group of members, including the Standard Bearer, attended the ‘Welcome back from Afghanistan’ parade of the Green Howards [2nd Batt. of West Yks. Reg.] in Richmond. A very pleasant day was had by all, with a good fish & chip lunch. 14th August 2010. Member Ron Herrington joined a trip, organised by Kirkby Malzeard branch, to the National Memorial Arboretum in Derbyshire. It was an interesting and moving day. November 2010. Eric Clark & Peter Fettes and their wives attended the Festival of Remembrance at the Royal Albert Hall, London. 8th April 2011. Some 10 Legion members accompanied by wives attended Lister House in Ripon to present a cheque for £700 to cover the cost of a pool table which the branch had provided for the use of the residents. The amount of the cheque included £200 given from the estate of the late Walter Myers. a stalwart member of the Grewelthorpe branch. 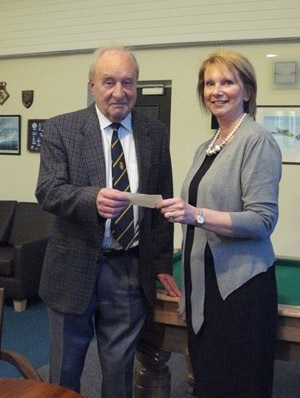 Chairman David Hartley presents cheque to the matron of Lister House. April 2011. 16th June 2011. A small group of members were given a conducted tour of Cobhan Aviation at Teeside airport by member Edward Threapleton. Everyone appreciated this most interesting visit and the time that Edward gave. September 29th 2011. A small party of members & wives attended at Ripon Cathedral on the occasion of the 90th Anniversary celebrations of the formation of the British Legion. November 2011. Festival of Remembrance. Our Standard bearer Graham Roberts paraded the Grewelthorpe standard at the Royal Albert Hall, London. Members John & Chrissie Thorpe also attended the service. November 2012. Festival of Remembrance. Rod MacAulay & Edward Threapleton together with their wives have once again been able to attend this worthy event at the Royal Albert Hall, London. June 2013. Several members visited the Elvington Air Museum. November 2013. Festival of Remembrance. Len Rowland-Jones [a past chairman] and his partner together with John & Chrissy Thorpe attended the event at the Royal Albert Hall, London. November 2014. November 2015. November 2016. Some members of the branch attended the Festival of Remembrance at the Royal Albert Hall in London. October 31st 2015. A number of members had a successful visit to the Green Howards Museum at Richmond organised by President Roger Chapman. Summer 2016 Tony Hill + Ian Bradley, Ron Herrington and Barry Marr made two outings. One to Newark air museum where they had an informative guided tour in the cockpit of a Vulcan bomber. Secondly they had an interesting visit to the Lincolnshire Road Transport museum. September 3rd 2017. Tony Hill, Ian Bradley, Barry Marr & Ron Herrington attended the Annual Battle of Britain Remembrance service at Elvington Air Museum. November 11th 2017. Tony Manning the Branch Assistant Standard Bearer paraded our standard at the the Festival of Remembrance at the Royal Albert Hall, London. August 8th 2018. Rod MaCaulay & Edward Threapleton found it a moving experience to attend the RBL GP90 celebrations in France/Flanders and to parade our standard at this event to remember the first such commemoration in 1928 of the ending of WW1 in 1918. On Friday 9th November Rod and Edward gave a very good presentation of their experiences to the villagers of Grewelthorpe in the village Hall. Over the years the branch has had its own social evenings at the Hackfall Inn and the Crown Inn Grewelthorpe. In the 1920’s and 30’s according to newspaper reports there were regular monthly whist drives held in the schoolroom. Following the end of the war in 1945, whist drives were reintroduced in the school on a regular monthly basis. In May 1946 a whist drive was held in aid of Queen Charlotte’s maternity hospital. 9th Febuary 1928. Ripon Gazette. 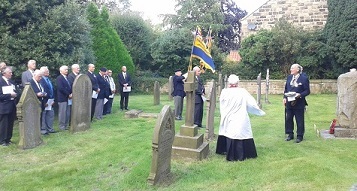 At the Sunday morning service at St. James’s Church Grewelthorpe, the ex-servicemen of Grewelthorpe attended under General Dalton to honour the memory of Earl Haig. All wore medals and poppies. The latter supplied by General Dalton. The preacher was Colonel Gethin. 1st March 1928. Ripon Gazette. Grewelthorpe ex-servicemen Association held a whist drive. Total receipts £6.14s.8d. At a meeting of the Association on Friday last it was proposed to have the annual trip to Keswick on Derwentwater. 5.12.1929. Ripon Gazette records a well attended meeting of the Grewelthorpe ex servicemen’s Assoc. was held in the schoolroom last Monday to form a branch of British Legion. Mr J.F.Reid presided and Major Vernon-Hope organising Sec. of the Yorkshire area of the Legion and Mr Husband of Ripon branch gave addresses. Also in attendance were officials of Masham & Ripon branches to give their support. After the addresses it was unanimously agreed to form a branch. Chairman J.F.Reid. Hon Sec. Mr John Goundry. Hon Treasurer Mr. G. Lofthouse with a committee of seven. 6th March 1930. Ripon Gazette. At the annual whist drive which was held in school, Mr Jowett was MC. A beautiful iced cake, given by Miss J. Richmond of Bramley Grange was won by Miss G. Tipling. The draw raised £1.4s. 17th December 1931. Ripon Gazette. Vice Presidents. John Dalton. R.A. W.Jowett. F.D. Moore. W.Westwood. Mrs Thompson. of Burn Brae. Miss A.J. Richmond. The secretary was nominated as delegate to the Annual conference to be held in Leeds in January 1932. The Annual whist drive will be held Jan. 28th 1932. 24 Jan 1932. Ripon Gazette records the death of Joseph Pickles. aged 72 on 22 Jan 1932. 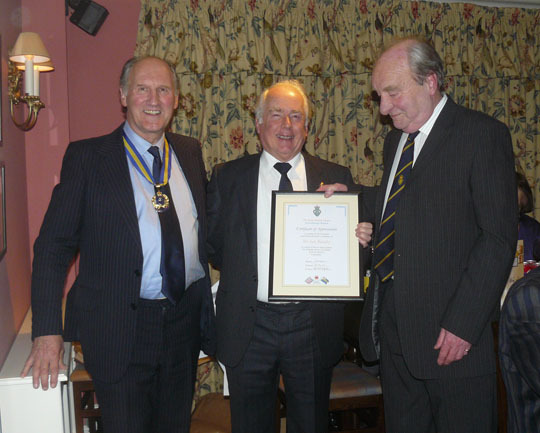 The following week the paper reports that the Grewelthorpe RBL members with Chairman Mr. Reid. stood in remembrance of Joseph Pickles. an assiduous member. 9.2.1933. Ripon Gazette records Brit. Legion AGM held last Tuesday. President General Dalton. A number of vice presidents. Chairman J.F.Reid. Hon Sec. J.Goundry. Treasurer G.Lofthouse. Vice Chairman A.Stelling. 24.5.1934. Ripon Gazette records the funeral of Miss Alice Jane E. Richmond. [Age 60] who died last Friday. 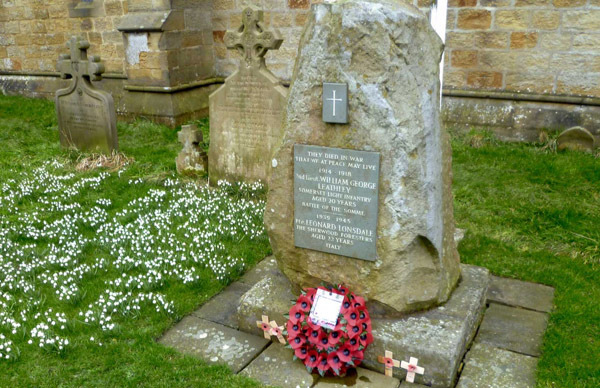 She was at the time of death a Vice President of Grewelthorpe British Legion. The service was held at St. James’s Church on Whit Sunday PM and upwards of 20 members of British Legion preceded the coffin. 3.1.1935. Ripon Gazette records the obituary of W.Jowett. 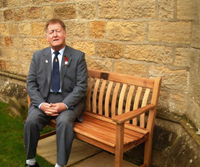 A great friend of the village and vice president of the British Legion. 2.5.1935. Ripon Gazette records The Illuminated Roll of Honour to all those from the Parish who served in WW1, was in the church porch and had faded. Minnie Jowett completed a full restoration and at their recent meeting the British Legion gave a vote of thanks for her kindness and this was unanimously passed. 16.5.1935. Ripon Gazette records the Brit. Legion attending the thanksgiving service in the church for the King’s Silver Jubilee last Sunday. J.F.Reid. Vice Chairman & Treasurer A.Stelling. Secretary J.Goundry. President Capt. C.Dalton. 10 Feb 1938. Ripon Gazette reports that the Brit. Legion held it’s Annual Meeting last Friday. Before the meeting members stood in silence and respect for the late John Goundry [Hon Sec. for many years.] The following appointments were made. President Capt C. Dalton. Chairman J.F.Reid. Sec. F.Taylor. Treasurer A.Stelling. 4 Vice Presidents. It was decided to hold an annual whist drive on 17th Feb.
6 April 1939. Ripon Gazette reports that the Brit. Legion held its Annual Meeting. The following were elected President. Capt. C. Dalton. Chairman J.F.Reid, Hon Sec. F. Taylor, Hon Tres. A. Stelling: Vice Presidents Capt. J. Dalton, J.Thorpe, Mrs Thompson, and Miss M. Jowett. 11th October 1945. Report in Ripon Gazette The AGM of the British Legion was held last Friday when election of officers was as follows:- President. Brig. Charles Dalton. There were a number of vice presidents which included Brig.J. Dalton. Chairman. P.Ashby. Hon Sec. W.Morley. Hon Treas. R. Stelling. It was decided to have a whist drive on 1st Wed. each month. Ripon Gazette 10th October 1946. British Legion meeting. The British Legion annual meeting was held on Tuesday last week. Rev. W.A.R.Goss. presided and assured the branch of the support of the church. The Chairman gave a report on the years activities and moved a vote of thanks to the secretary and other officers. The Treasurer submitted a satisfactory financial statement. Results of elections were as follows. President. Brig. C.A.G.Dalton. Chairman. P.Ashby. Vice Chairman. H.Hall. Hon Sec. W.Morley. Hon Treasurer J.Buck. Plus 5 vice presidents. A church parade is to be held on Nov.10th 1946 at 10-30a.m. January 1948. Ripon Gazette photo showing New Year dance for Grewelthorpe British Legion held in the Institute. It is thought this may be the Mechanics Institute in Kirkby Malzeard. Pre 1979 and until 1991. The Legion entertained members of the Wounded Warriors from Leeds. VE/VJ Celebrations in the village. A joint effort from organisations in the village went down well. Village children presented with commemorative mugs. Peter & Peggy Bradley present mugs. The locality enjoyed an excellent celebration dance in the evening at Masham Town Hall with Swing Band Echo 42 from Harrogate. 1940’s style dress. Evening largely organised by Ian & Barbara Bradley. Town Hall decorated out with red, white & Blue with the Victory Roundell on the stage flanked by the Union flag and the Stars & Stripes. Letter sent to the Prime Minister re Disability war pensions. An acknowledgement received from No. 10. and a response from the DSS. Block & Gavel presented to the Chairman by Fred Smith. from members of the Guards Association. Member Ian Bradley & his wife have been with Remembrance Travel on visits to war cemeteries in South Germany [Durnbach, Bavaria] in 1999. The Somme [Arras & Thiepval] in 2000. Southern Italy [Cassino] in 2001. also with Harrogate Victory members to the National Memorial Aboretum near Rugeley in Staffordshire. A framed wire embroidered Legion Emblem purchased and presented to Bob Ascough. for long service as member and chairman. Eric Ashby and Bob Ascough in 1997. Edward Threapleton. [Ex Group Captain RAF] awarded Queen’s Commendation for Bravery in the Air re. Search & Rescue of a private flyer in Scotland. Edward Threapleton at RAF Leeming. 2006. 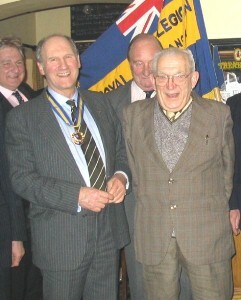 At the Annual Dinner in March 2007 Edward was presented with a framed memento. Medal Presentation 13th June 2013. Ron Herrington was presented with the Arctic Star to recognise his service in a Royal Navy cruiser escorting convoys to Russia during WW2. 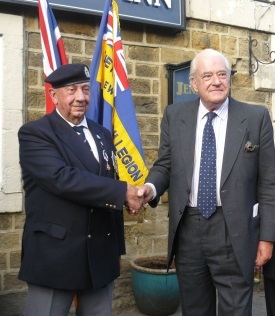 Ron now aged 86, received his medal from Anthony Chisenhale-Marsh, Deputy Lieutenant of North Yorkshire, at a brief ceremony at The Crown Inn, Grewelthorpe, organised by the Grewelthorpe branch of the British Legion. Berwick patrolled between the convoy & the Norwegian coast & accompanied aircraft carriers when they attacked the German battleship Tirpitz in a fjord. Berwick also sailed to Murmansk on one of its North Sea runs. After the war, Ron, originally from Tunstall near Catterick, emigrated to Australia, but returned to N.Yorks after the death of his wife, to be near his family. He says ‘I’d like to pay tribute to the men of all 3 services who worked on the Arctic convoys – many of them didn’t return, and many have died in the meantime. This medal has been a long time coming, but I’m very pleased and proud to have it. The branch president commented ‘We are very grateful to Ron and all his comrades for their dedication in this dangerous mission of running supplies to Russia – what Churchill called ‘The worst journey in the world’. His Arctic Star is well deserved, especially after so many years, and we are proud that we have been able to present it to him.’ In 2015 He is still awaiting his USHKAMOV medal from Russia re. his Arctic Convoy service. Ron has written an article about his recollections of VE Day 1945 whilst he was in the Royal Navy at Trondheim. It is intended to appear in an RBL magazine. In 2016 Ron received the Russian Ushakov medal from the Russian ambassador re his service on the Arctic convoys. Grewelthorpe British Legion members congratulate Ron at the ceremony. A few years ago Kirkby Malzeard branch, which has few members, approached Grewelthorpe with a view to amalgamation or becoming a sub branch to Grewelthorpe. After discussions they decided not to pursue this but on approaching us again in the last couple of months it was agreed by both branches that Kirkby would become a sub branch to Grewelthorpe. This was ratified by National and confirmed at the turn of this year. August 4th 2014. 100th Anniversary of the start of World War 1. Service held in St James Church with ceremony at war memorial after. Summer 2016 Re. the occasion of the Queen’s 90th birthday , Ron Herrington who was also 90 in 2016 was invited to attend a special service at Ripon Cathedral hosted by the Lord Lieutenant of Yorkshire. 25th June 2016 The President, Roger Chapman, organised a presentation about the Battle of the Somme and the life of 2nd Lieut. 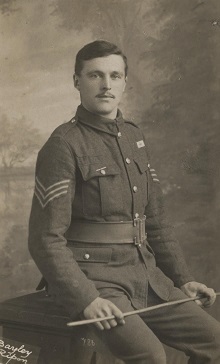 William George Leathley who was killed in action on 1st July 1916. This was a successful evening in the village Hall. 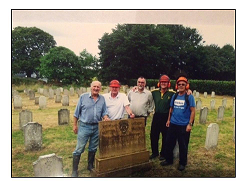 2016 During the year some of the branch members gave a lot of time to clearing and tidying up the RBL section of Sharow Church graveyard. They made a successful job of this and the RBL county will fund the upkeep in the future. The branch received much praise for this effort. 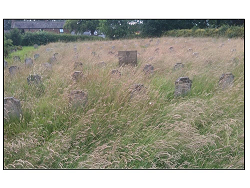 Sharow churchyard before and after work. Some of the workers. 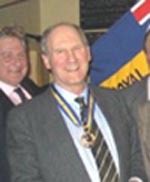 Left to right President Roger Chapman. Edward Threapleton. John Oldridge. Tony Manning and Roger James. 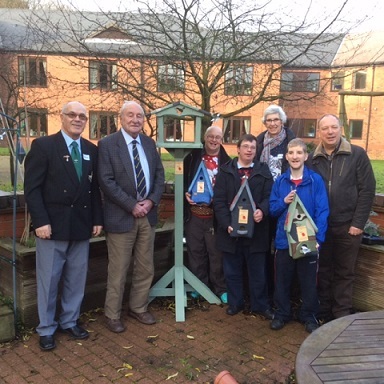 On 16th December 2016 the branch made a presentation to Lister House, Ripon of several bird boxes and tables which had been made at the Jennyruth workshop in Ripon. These were much appreciated by the residents. Picture shows Roger James. David Hartley and members of the workshop’s staff. 2017 The branch was awarded the RBL Area Trophy ‘Alderson Cup’ for the best administration. The memorial was first suggested in March 1985. Finally erected in July 1993 and dedicated in November of that year. The drive and initiative for this project came from Fred Smith. Leonard Lonsdale of Grewelthorpe served in WW2 with the Sherwood Foresters. 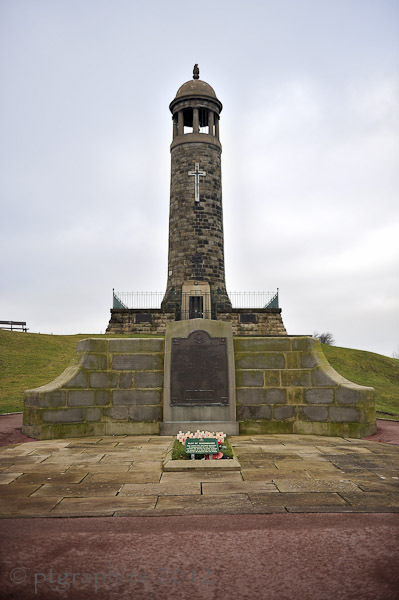 There is a memorial to the Sherwood Foresters in Crich, Derbyshire. It was built and dedicated in 1923 to commemorate those lost in WW1 and then rededicated in 1952 for those lost in WW2 and any subsequent military conflicts. William George Leathley is also mentioned on the memorial. His details can be found elsewhere on this web site. History section. 6th June 2004 Short service at the memorial commemorating D.Day. 8th May 2005 Short service at the memorial to commemorate the end of the war in Europe. 10th July 2005 Long service in church and memorial to commemorate the end of WW2. 21st August 2005 Short service at the memorial to commemorate the end of War in the far east. Each year there is a church service on Remembrance Sunday followed by a ceremony at the memorial and the laying of a wreath. 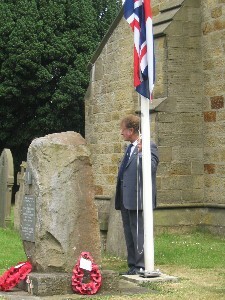 David Hartley lays the wreath on memorial in 2005. Watched by Legion bugler Anthony Prince and Tony Hill by flagpole. 11th November 2008 Gathering of 12 British Legion members and children from Grewelthorpe C.E.School to lay poppies on the war memorial to mark the 90th Anniversary of the end of WW1. Below. Members of British Legion attend wreath laying ceremony to mark 90th Anniversary of the end of WW1. Nov 11th 2008. Left to Right. Tim Stebbings. Paul Holloway. Ron Herrington. Ian Bradley. Ian Horsford. Edward Threapleton. Eric Clark. Graham Roberts. There is a grave in Grewelthorpe Churchyard for Norris James Moore known as Jim. He was a serving soldier in WW2 and he is related to the Lonsdale family. He died in a hospital in Oxford in 1944 of a type of meningitis, according to family sources, and because he did not die in action his name cannot be included on the war memorial. This was first suggested pre 1989. Then in January 1989 by Bill Dobson. Then again in May 1995. The standard was finally dedicated in November 1995. It was conceived, made and dedicated principally due to Fred Smith. Fred was the first standard bearer and this duty was taken over by Graham Roberts. 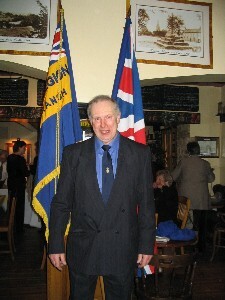 Graham Roberts standard bearer in 2005. Flagpole in St. James’s Churchyard. This was first suggested in November 2000. The flagpole was donated by John & Lynda Oldridge. H. Hill & Sons provided the base materials and mixer free of charge. It was completed in May 2003. Erected and dedicated. Installed and dedicated in July 2005. to commemorate the 60th Anniversary of the end of WW2. Donated by H.Hill & Sons. Tony Hill. tries out the seat. 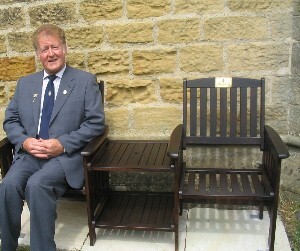 The seat was vandalised in 2009 and Tony Hill organised a collection around the village and bought a new seat. This was installed and dedicated in the churchyard in November 2009. Tony and the new seat. Reported in the Ripon Gazette. Monthly whist drives in 1920’s and 1930’s. Car Boot Sale. 27th May 2007. Superb effort by Tony Hill. but marred by terrible wet weather on this Spring Bank Holiday Monday. £187 raised for Lister House. Cycle ride 2011. John Oldridge was a support driver for a sponsored bike ride across America. He raised £530 for branch funds. Freda Thompson. Pre 1969 – 1986. Peter Fettes. 2003 – 2014. John Oldridge. 2014 – 2017. 1930 Poppy Appeal raised £3.18s.1d. 1931 Poppy Appeal raised £3.10s. 1932. Poppy Appeal raised £3.6s. 1933 Poppy appeal raised £3.8s.0d. 1934 Poppy appeal raised £3.15s. 11d. 1935 Poppy Appeal raised £3.14s.3d. 1936. Poppy Appeal raised £3.8s.10d. 1937. Poppy appeal raised £3.14s.4d. This money raised as follows:- Mrs C.J.Ascough collected £1.5s. Miss M.Thompson collected £1.5s.2d and Miss Dobby collected 10/3d. Miss F.Richmond collected 13/11d from Bramley area. 1938. Earl Haig Poppy Appeal raised £3.1s.7d. This was lower than last year. 23.11.1939. Poppy Day. The house to house collection on behalf of the Earl Haig fund was this year a record £5.2s.6d. 21.11.1940. Poppy Day. The house to house for the Earl Haig fund raised £4.13s.5d. 20th Nov. 1941. Poppy Day collection. The house to house collection raised £5.5s.1d. 19th Nov. 1942. Poppy Day. The sale of Poppies on behalf of Earl Haig fund realised £5.18s.0d. 18th Nov. 1943. Earl Haig fund. The poppy sales in the village for the Earl Haig fund raised £5.16s.7d. 22nd Nov 1945. Poppy Day. Total amount collected in aid of Earl Haig’s fund from Grewelthorpe & Dist. was £7.0s.3d. 14th November 1947 [Ripon Gazette] British Legion held a whist drive in the school in aid of Earl Haig’s fund. Mr E.Horner was MC. 28th November 1946 [Ripon Gazette] Poppy Day. The result of the sale of poppies in Grewelthorpe & District was £8.15s.0d. Other contributions to the Earl Haig fund amount to £5.2s.0d. The Total was £13.17s.0d. an increase of £5.15s.9d on last year. November 1978 Sale of Poppies raised £51. Superb collection efforts by Tony Hill. from 2004 to present. Tony manages more often than not to beat the previous years record takings each year. Appeal raised including church donation 2004 – £730 – 51p. 2005 – £827.60p. 2006 – £922.25p. 2007 – £1101 – 71p. 2008 – £1106 – 59p. 2009 – £1368.27p. 2010 – £1287.50p. 2011 – £1298.87. 2012 – £1408.81p. 2013 – £1699.34p. Tony’s Quiz/Raffles held at the Crown Inn have become a regular effort to raise money for the poppy appeal. In 2013 they raised £312. In 2014 The total amount raised was £1745. In 2015 the total amount raised was £1779.38p an increase on last year. Tony Hill again produced sterling effort. In 2016 the branch appeal raised £2238. again largely due to Tony Hill’s efforts. In 2017 the branch appeal raised £2564. a 24% increase again largely due to Tony Hill’s efforts. 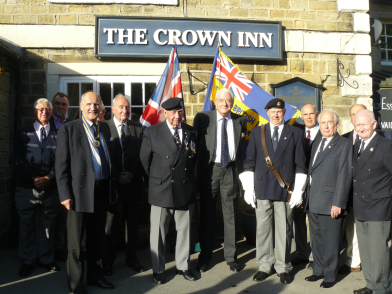 Crown Inn very generously donated £400 from their separate armistice day function. In 2018 the poppy appeal raised £2719. This year Tony Hill’s personal total was £1439. an increase of £110 on 2017. Tony Hill receives an award for poppy selling in 2006 from Roger Chapman. This has fluctuated over the years. 2015 & 2016 – 29. 2017 – 27 + 10 for Kirkby Malzeard. 2018 – 27 + 10 for Kirkby Malzeard. Crown Inn, Grewelthorpe pre 1985 – 1986. Crown Inn 1994 – Nov 2008. When the Crown Inn was regrettably closed by the brewery. In 2009 meetings were held on a temporary basis, pending clarification of the Crown Inn’s future at the White Bear, Masham. Resuming at The Crown Inn Grewelthorpe in mid 2009. This article is being researched by Ian & Barbara Bradley.2008/13. It will be added to as more information becomes available. If you have any photographs or information about the Legion that you can add please contact us.